HMO stands for “House in Multiple Occupation”. This is a legal and officially defined term, with the expression having precise meanings at both local and national government levels. Do note though that there is some scope under legislation for the term to be interpreted differently between local authorities. It’s also important to bear in mind that there may (or will) be legal differences depending upon whether you’re in Wales, England, Scotland or Northern Ireland. The position outlined in this guide is therefore a generally applicable summary. It may be necessary to check specific points of detail with your own local authority. the “scale” of the property in total – comprising several of the above factors plus how many floors it occupies. where the property meets certain criteria, it will be defined as a “large HMO”. That might include things such as having more than 5 tenants, the property running over three floors or more of a building and the tenants sharing facilities. Sometimes, confusion arises when landlords confuse bedsits and HMO’s. A bedsit is defined by the government as typically a single room in a property, which is let out. The tenant usually shares all or the majority of their facilities (WC, bathroom, kitchen etc.) with other people in the property. Once you have three or more bedrooms let out as bedsits, then typically your property will meet the criteria of being an HMO. This applies even if you are resident in the property too. Do note, however, from 4th May 2018 new legislation comes in to force that means most HMO’s will be subject to mandatory licensing. This new legislation also changes the definition of an HMO with the removal of the reference to storeys from the prescribed description of large HMO’s. This means that most HMO’s, occupied by five or more people from two or more separate households, will be subject to mandatory licensing. This could mean that landlords who currently own house shares will need to comply with the new legislation – or face a fine. This isn’t just definitions for the sake of it. 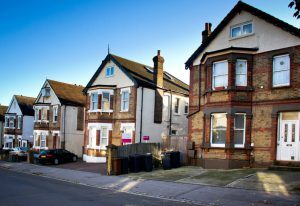 As a landlord, you will have very significantly different legal and landlord insurance obligations based upon whether you are a landlord providing bedsit, HMO or large HMO accommodation. These are covered in later sections of this guide. However, even at this stage it’s worth mentioning that large HMO’s will require a licence from their local authority. Depending upon where you live, even small HMO’s may also require one (check with your local authority). HMO’s are popular and seemingly becoming more so. That applies to both tenants and landlords. in certain situations, HMO’s can make it easier to obtain property financing, as lenders may appreciate the more diverse and secure income stream projections associated with that. some tenants may welcome the more communal and reassuring presence of other tenants in the property. That can be far more comforting for many tenants than say a simple bedsit arrangement in a property shared with the owner alone. This is frequently a thorny issue in conceptual terms. local emergency services (e.g. fire safety officers). The provisions of the 1985 legislation provide an approximate reference point in stating that an occupied room must provide a minimum of 6.5sq metres of space per adult. Children between 1-10 years old count as half an adult in that sense. Unfortunately, this position has historically been something of a minefield of legal interpretation and once again, the position becomes even more complicated depending on which country of the UK you live in as well as your particular local authority. In what follows, for simplicity, we’ll be speaking about the typical (though not universal) position as it exists in England. If your property proposes room sizes that are below those above, then it’s perhaps likely that your licencing application will be refused. Once again, an appeal is possible but if the room(s) fails to meet national legislation minima as well as the local licencing authority’s guidelines, your appeal is probably going to fail. NB: Please note that these sizes are correct as at the time of writing – September 2017 – but may be liable to change. Whether you live in an area where licencing is mandatory for HMO’s or not, you will be required to comply with national and devolved government laws plus local council regulations. These are extensive and far too lengthy to detail here. What can be said is that your legal obligations will typically come under a number of general headings. You will be obliged to provide a range of basic services. That obligation will usually include things such as water, electricity, heating facilities of one sort or another and of course, sanitary arrangements such as access to a bathroom and WC. You will be obliged to make sure that all these services and utilities, notably gas and electricity, are delivered safely (see below). Tenants must also have access to waste disposal facilities. Shared areas of the property must be kept clean and safe – this is your responsibility under law and you cannot delegate that to your tenants. It is reasonable to make a condition of their rental agreement that they play their part in helping to keep such areas clean and tidy as that applies to their use of them. You could not though, make it a requirement that they cleaned (e.g.) mould off window sills etc. The exterior of your property must also be kept clean and in good order. Items and fixtures around your house must be kept in good working condition – examples include windows that can open/close easily, doors with working privacy locks and so on. You may, depending upon where you live, be obliged to have a formal tenancy agreement in place. In addition, you may be required to show that you have full landlord insurance of a type that’s appropriate for your HMO. That may be a legal requirement and also one underpinned by your buy to let mortgage agreement if you have funding outstanding on your property. the HMO must contain fire-fighting and other fire safety facilities including emergency fire exits and lighting. Of necessity, this has been a very brief overview. Your local authority should be able to provide you with locally relevant, specific and detailed advice and guidance on all of these subjects. If your property is defined as a large HMO, then it is almost certain that you will require licencing from your local authority. In cases where you have a standard HMO, then it’s highly likely that you will need a local authority licence though that may vary slightly. It would be unwise to start your business on the assumption that you do not need to apply for a local authority licence. Check with them to be sure and accurately describe your planned business to them. Another point worth mentioning is that at the time of writing, further proposed changes to licencing are being considered and there are some test cases going through the courts. It really is essential that you get the very latest updated situation and requirements from your local council. The penalties for failing to meet these regulations can be heavy, so a little discovery and validation up front is VERY highly advisable. if you’re using a business manager or property manager, you may need to provide their details so that they can be checked against “fit and proper person” criteria. Typically you will need to wait for confirmation of your licence before you commence letting. You will also require a licence per let unit. As has been touched on previously, from a number of perspectives, having correct landlord/HMO insurance cover is essential. However, it’s worth considering this from the point of view of your business rather than simply compliance with the requirements of others. Landlord’s insurance can offer you financial protections against a range of risks to your property and its contents. It also might prove to be all that stands between you and financial ruin if, for example, one of your tenants successfully sues you for injury they’ve suffered in your property. it’s worth noting that it is becoming ever easier for tenants to sue landlords (for various things) and the tendency to litigate is becoming more pronounced. You should have appropriate legal cover included. If you have any questions, you should contact us for a discussion as soon as possible. At Cover4LetProperty, we have extensive experience in all aspects of landlord insurance and HMO cover. We would be only too happy to place that at your disposal for advice and guidance.